You’ll see all three of my Bachmann “Thomas & Friends” locomotives in this new video, and it’s my way of introducing you to the newest train in my collection: James The Red Engine. I set up an indoor layout today, since it’s the middle of winter where I live and running the trains outdoors is just going to have to wait another month or two! While this video is mostly about James, I do also follow Thomas The Tank Engine for a brief loop around his portion of the layout… and Percy and the troublesome trucks are also visible numerous times throughout the video. Notice that James is running on a completely independent set of tracks that is not connected to the tracks where Thomas and Percy are running. That’s because the Bachmann G-scale models of Thomas and Percy have DCC control circuitry built in at the factory, and therefore can run on a digital layout and be controlled from a phone or table using the MRC Prodigy WiFi controller. James The Red Engine is not available in G-scale with DCC built in, so it has to run on a separate set of tracks powered by a traditional analog power supply and control system. All of these trains were purchased from Trainworld.com and so was the MRC Prodigy WiFi digital control system that I use to operate the DCC trains. I should mention that there’s one thing about this video that is a little misleading! The G-scale version of James The Red Engine does NOT have any sound equipment built in and does not actually make the chugging sound that you hear in this video. 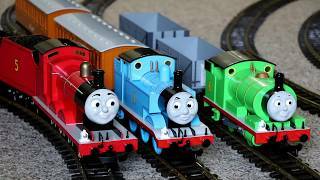 The chugging sounds you hear are those of Thomas and Percy, which do have built in sound systems in the DCC versions. The video sounded really odd to me when James headed down the hallway and did not make the chugging sounds, so I decided to fake it a little and just overlay the chugging sounds from Thomas & Percy. I mention it here just so that no one goes to order the G-scale version of James and is disappointed to find it does not make the sounds you here in this video. It really just squeeks and creaks a lot as it rolls down the tracks! That sounded bad on the video, so I decided to resort to a little trickery to make the video more enjoyable. I hope you don’t mind! We are fostering a litter of puppies at our house this month, which will keep me too busy to make any other new model train videos for a little while. During March 2019, expect to see a lot of puppy videos on my YouTube channel, and during April expect to see some new cruise ship videos. Somewhere around the end of April or early May, I’ll probably having something new to share in the way of model train videos.